It’s seldom that one comes across something- especially a place- that tends to give them so much in return. Palava gave me more than what I could ask for when we shifted to this city. I am a teacher by profession and I teach at Don Bosco School at Matunga. My family and I moved to Palava some 2 years ago and since then, there’s been no looking back. Palava has helped me discover my individuality and learn to appreciate it. I have always been inclined towards running, but never really thought of pursuing it as a hobby. Initially, I started by walking around the complex as I was apprehensive to start running. Gradually, I grew more confident and my running also improved with time. A few of my neighbours saw me running and urged me to participate in the various marathons held in the city. I trained myself for these marathons and I have run numerous marathons till date. I have no qualms about crediting my success to Palava for providing me with the best facilities to practice and for making me realize my dream. I’m very proud of myself today as I have been able to encourage several women of Palava to run for their good health. 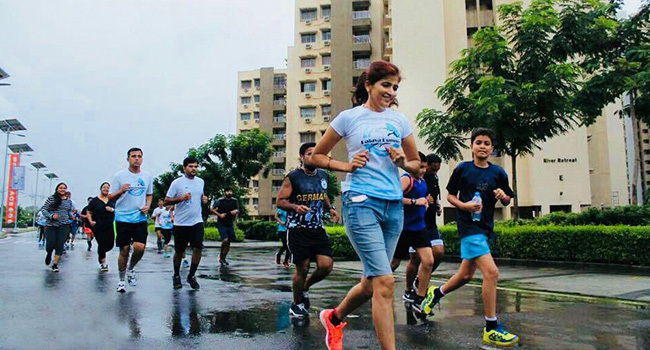 My dream of running the Mumbai Marathon was fulfilled in January 2018 when I ran the marathon for 21 km. I’m training myself hard to cover the 42km stretch and I’m sure I’ll get there someday. My day begins at the crack of dawn, and I go for my morning run at 5 AM. Then, I cook for my family before rushing to work. Once I return from work, I destress myself by going for an evening jog. #PalavaMakesMeMore committed to running and urges me to keep training and give my best for future marathons.